In July 2017, we also held a seminar on cumulative investment strategies for distributors in preparation for the launch of cumulative NISAs, which a total of 70 distributors attended. ※ Figures for publicly offered funds are aggregated. ※ "Equity investment" includes REITs. 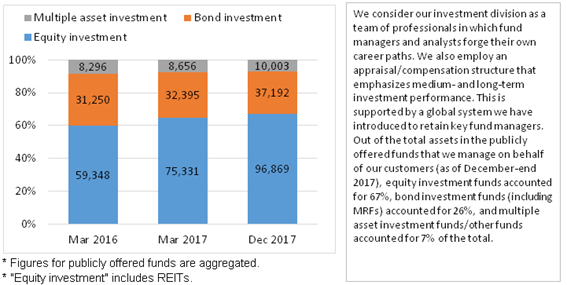 Out of the total assets in the publicly offered funds that we manage on behalf of our customers (as of December-end 2017), equity investment funds accounted for 67%, bond investment funds (including MRFs) accounted for 26%, and multiple asset investment funds/other funds accounted for 7% of the total. ※ Publicly offered open-end funds. AUMs are as of end-December 2017. Funds with AUMs below JPY 10 billion are excluded. Our starting point for institutional investors is to find out our customers' needs, and to work hard to meet those needs. In our sales activities, we then propose products in line with each customer's level of risk tolerance. As a part of these efforts, in December 2017 we launched a tool and used it to start providing support to help our corporate investor customers improve their risk management. As of end-December 2017, the support tool was being used for 19 accounts. We work daily to develop products that serve the interests of our customers. In the past year (January-December 2017), external assessment institutions have given awards to four of our Japanese equity funds, two of our Japanese bond funds, four of our foreign equity funds, four of our foreign bond funds and six of our balanced funds, recognizing a total of 20 of our funds. * Aggregation of awards from R&I Fund Awards, Fund of the Year (Morning Star) and Lipper Fund Awards. Our fund managers and analysts have always been proactively involved in engagement and proxy voting in order to help firms in which our active strategies invest improve their corporate value. In the more than four years since 2013, we have worked to boost the corporate value of a wide range of firms, including their ESG levels, by starting the assigning of CSV scores (a way of giving firms comprehensive assessments that include ESG scores) to 500 firms. 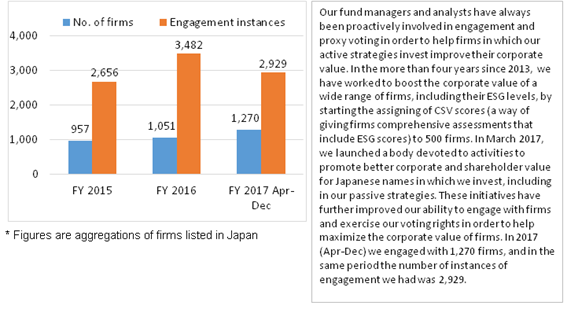 In March 2017, we launched a body devoted to activities to promote better corporate and shareholder value for Japanese names in which we invest, including in our passive strategies. These initiatives have further improved our ability to engage with firms and exercise our voting rights in order to help maximize the corporate value of firms. In 2017 (Apr-Dec) we engaged with 1,270 firms, and in the same period the number of instances of engagement we had was 2,929. Since launching the Nikko Eco Fund in 1999, which invests in environmentally friendly firms and is Japan’s first Socially Responsible Investing (“SRI”) fund, we have incorporated ESG factors in all of our investment management processes based on our understanding that they contribute to medium- and long-term corporate value. We also constantly introduce new initiatives in order to put our ESG activities into practice more effectively. Since August 2013, we have been applying the principle of Creating Shared Value (“CSV”; the practice of creating value for society and firms by aligning efforts to solve societal issues with corporate interests and pursuing both goals simultaneously) by having our analysts formulate unique CSV scores that incorporate comprehensive assessments of firms’ financial standings, market competitiveness levels and ESG initiatives, and use them in their stock selections. We currently formulate scores for the 500 stocks listed on the Tokyo Stock Exchange and are working to assess more names in the future. We have already built up a track record of over four years of assessment and engagement based on our analysts’ close engagement with the 500 firms whose CSV scores we assess and their daily work to improve corporate value including ESG. ※ AUMs are as of end-December 2017. ※ Open-end, publicly offered funds. We position our governance activities among the most important of our corporate activities, and all of our efforts in regard to voting rights governance and fund governance—as well as the obvious example of management governance—are directly reported on to our Board of Directors. Furthermore, based on our conviction that the best governance can only be achieved with scrutiny from outside, we strive to maintain independent oversight by appointing even more outside directors to our Board of Directors than the number required of listed firms, and by ensuring that our voting rights governance and fund governance are monitored by committees that not only consist of a majority of outside members but have their chairpersons appointed from among those outside members. Our business operations are presided over by a senior management team that is well versed in the asset management business. At the same time, we ensure high levels of independence and transparency in our governance by having four independent outside directors in our Board of Directors, three of whom are pure outsiders who have no capital relationships with the company. We also cultivate relationships with the distributors we work with that are cooperative in a way that transcends mere capital ties by striving to provide all of them with the best products and services. We established the Stewardship and Voting Rights Policy Oversight Committee in June 2016 as a way of improving transparency in our stewardship activities such as engaging with firms and exercising voting rights as well as strengthening our governance. Drawing the majority of its members from outside the company, the committee is the first such third-party body to be established at a Japanese asset management company. It holds meetings once a quarter in principle and provides a venue for outside committee members to have lively discussions on how Nikko AM exercises its voting rights. The committee has held a total of six meetings so far. 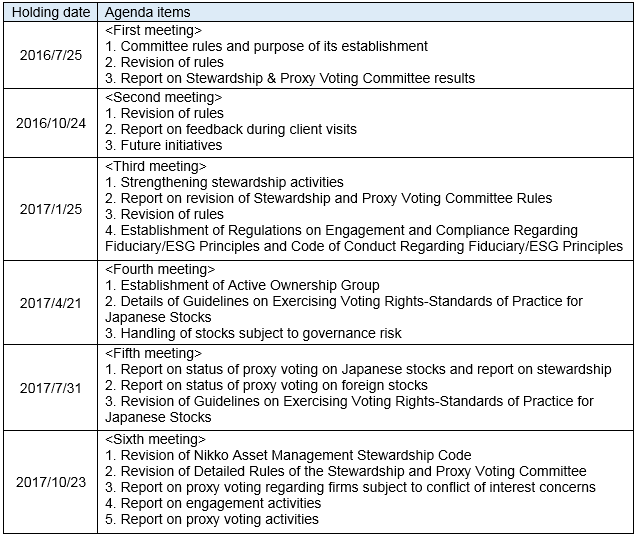 The Stewardship and Voting Rights Policy Oversight Committee (the “Oversight Committee”), the majority of whose members are from outside Nikko AM, was established in order to improve transparency and strengthen governance in the company’s engagement with firms, as well as stewardship activities such as exercising voting rights. The Oversight Committee’s role is to oversee our stewardship and proxy voting activities from a third-party standpoint as a body whose members are mostly from outside the company. Specifically, the Committee provides oversight to the Stewardship & Proxy Voting Committee (the “Voting Committee”). The Voting Committee had its name changed in September 2016 from its former name of the “Stewardship and Voting Rights Policy Committee”. The Voting Committee’s role was also clarified at the time of the name change. We established the Fund Advisory Board, whose members are also mostly from outside Nikko AM, in September 2017. The Fund Advisory Board meets every quarter in principle. At its first meeting in November, outside committee members had lively discussions on Nikko AM’s fund governance. We established the Fund Advisory Board in order to equip Nikko AM with an operational framework governing development processes and post-launch operations for the funds it launches—particularly for publicly offered funds—that incorporates fair and knowledgeable perspectives from outside the company while also being coherent and transparent to customers. The Fund Advisory Board is also intended to provide suggestions and advice on how to increase customer convenience and truly serve customers’ interests.